USGS on their mission to explore African drought | Watts Up With That? From the USGS here, I thought their mission was the United States, hence the US in USGS. Seems they’ve expanded the mission to Africa now. Disappointingly, there’s no mention of land use change, agricultural practices, or deforestation issues like the one contributing to the glacier melt on Kilimanjaro. Evapotranspiration is a very important issue for local moisture content and convective cloud development. As the globe has warmed over the last century, the Indian Ocean has warmed especially fast. The resulting warmer air and increased humidity over the Indian Ocean produce more frequent rainfall in that region. The air then rises, loses its moisture during rainfall, and then flows westward and descends over Africa, causing drought conditions in Ethiopia and Kenya. Scientists compiled existing datasets on temperature, wind speed and precipitation to see what was driving climate variations in the tropical Indian and Pacific Ocean region. Most of the Indian Ocean warming is linked to human activities, particularly greenhouse gas and aerosol emissions. The Indian Ocean has warmed especially fast because it is quickly being encroached upon by the Tropical Warm Pool, which is an area with the warmest ocean surface temperatures of anywhere on earth. This research supports efforts by the USGS and the U.S. Agency for International Development through the Famine Early Warning Systems Network. FEWS NET is a decision support system that helps target more than two billion dollars of food aid to more than 40 countries each year. Through this system, scientists are helping with early identification of agricultural drought that might trigger food insecurity. For more information, visit http://www.fews.net. The article, “A westward extension of the warm pool intensifies the walker circulation, drying eastern Africa,” was published in Climate Dynamics and can be found at http://www.springerlink.com/content/u0352236x6n868n2/. Guess they never heard of the Aral Sea either. The fact that eastern Africa has been the site of almost continual conflict for 50 years, leading to the disruption of irrigation, water conservation and proper farming methods has of course, nothing to do with it. I guess I am just a dumb economist. I thought the “settled science” concluded that the arctic was warming faster than any other area of the world. This paper states that the Indian Ocean is warming the fastest. Can someone set me straight. Also, I wondered if it occurred to them that if the drought in East Africa was the result of a warming world, then the drought could soon be over as the world cools. I guess one could take comfort in the fact that they are positing a falsifiable prediction. We will know soon if they were correct! About 4 or 5 years ago National geographic had an article claiming that archeological evidence showed that the Sahara was formerly a savannah when temperatures were 1-2 degrees C warmer than now, and that it started to dry as temperatures declined some 5000 years ago, with the populetion moving to the Nile valley and starting what became the Egyptian civilisation. Cooler -dryer then, warmer-dryer now. Who knows? So, again, whatever happens it’s due to CO2, AGW. It’s not raining like the IPCC said it should so the USGS says it’s still AGW causing the problem of no rain. Go figure. As a student of cycles I like google for the timelines . . .
I’ll wait to see what everyone else thinks . . . as I know droughts are more common than this timeline. I do know that if you feed starving people. . . they will be a friend and ally for life. . .
“they saved my life” . . . they say . . .
We all know that famous quote . . . . . . . . . . “Knowledge is Power . . .
it’s my understanding that the . . . . is a Rothchild quote. In other words, whatever happens will be consistent with our theory. Less rain: we told you so; more rain: we told you so. couldn’t afford to act upon it, or may even use it as a weapon to control their populations. Produce a reliable forecast, then talk about releasing it to Governments. Another thought on this, the only thing that will change this continuous drum beat is if and/or when the “researchers”, and I use that term with great trepidation, can obtain money for proving that AGW is the farce that it is. One can always follow the money to the answer as to why folks do what they do. Didn’t we learn this in high school? The areas of East Africa they are talking about are in a rain shadow, therefore will experience drought or simply be desert. This is basic. We have this in the desert SW of the USA, the “Great basin” that covers eastern Washington and Oregon. Yep, the USGS is your premiere source for climatology and inexpensive maps! I want my tax money back. But if they’re incorrect, it will only mean that its worse than they thought. Oh, and they need more money to make better predictions. What’s with this 4 or 5 years ago. Howa bout 7-Jan 2011, which I think is more recent. I quote ” The data suggest that the Sahara desert was a land of lakes and rivers about 130,000 years ago. when moderns first left Africa for sites in what is today Israel. ” The paper is about the first exodus of man from Africa; previously it was thought they hopped a cruise ship in Kenya (East Africa) but now they thing they left Africa by going North into Israel. Imagine that, way back then, our ancestors were smart enough to know to go north to get to the promised land. Actually from the article it is clear that they actually went East from west Africa, instead of going North from East africa, for the exodus sites are mostly in Morocco on the west coast, so they had to cross the whole of the sahara, and ford all those rivers, and swim across all those lakes. So who actually believes they were actually going anywhere; other than chasing that zebra for dinner. Most of them had never heard of Israel, let alone wanted to immigrate there. They can come up to Boston and export all the snow they want on their own dime. I start to appreciate a very simple view about the connection between temperature and precipiation and this appears to work better than climate models. 1. Warming temperatures lead to more evaporation, and therefore more precipitation. fast cold to warm: the atmosphere can quickly accomodate more water vapor, less precipitation is released. fast warm to cold: the atmosphere cools fast, heavy precipitation is released quickly. 1 would be what we expect from increasing temperatures (due to natural climate change or whatever) and would be generally beneficial to mankind (as history has proven). 2 would be what we expect from WEATHER events, such as a start of an El Nino, or currently a La Nina following an El Nino (as we currently observe). Sounds sufficiently scary to ‘deserve’ some big grants, but of course the authors already knew that. Again you start with a conclusion then work back to the staring conditions. While the glacial change on Kilimanjaro is not as well understood as we would like, I believe Dr. Lonnie Thompson found ice core evidence that showed the glacier survived a 300 year drought in the region some several thousand years ago. It seems strange that this particular “drought” today that is caused by deforestation and land use would on its own cause such a seemingly sudden and profound decline in a glacier that is over 11,000 years old. Plus, he found evidence that there has been melting in recent years in some of the ice core samples, indicating a period of higher temperature at the mountaintop. Plus, a vast majority of other glaciers around the world are retreating, seeming to indicate a global warming trend. Mt. Kilimanjaro may be immune to what is affecting the other glaciers, but the evidence I have seen from Dr. Thompson doesn’t seem to rule out the global warming possibility. The glacier loss on Kilimanjaro may be a contribution of both effects. So, bottom line, I like the wording that deforestation is contributing to the glacier loss in this article, but the title of the WUWT article that is linked is too forceful. That seems too forceful, since folks like those contributing to the Proceedings of the National Academy of Sciences reached no concensus on the Kilimanjaro glacier retreat either way (at least in the article I saw a year ago). Interesting article, though. It is good to see climate knowledge put to use to help folks that may be affected by food security issues. I say: Sorry Scott . . . they stole it “fair and square”. Perhaps they should have read this little piece written some time ago now but puts things into some sort of perspective on the subject of African droughts. Quit worrying about Ethiopia-most of them have moved to minneapolis Minnesota. And the “G” is for geology. Makes ya wonder why they are dabbling in Climatology . . . . maybe because that is where all the money is ? Oh No! Now that they are claiming it, we will surely soon see huge rain falls in that area of the globe. Why can’t they just shut up? I guess the US Navy should confine itself to US waters and NASA will need to restrict itself to satellites over just the good old U.S. of A. What were they thinking by sending probes to OTHER PLANETS? I got into the first few lines then issue, it`s all down to global warming, bugger all to do with entire forests being chopped down for fuel? How about we actually help them manage the land? And not just throw zillions at tinpot dictators to squirrel away in a swiss account? Also this? If the water gets warmer then it evaporates right? And becomes rain? so how can a warming ocean lead to less rain? Eminent hydrologist Will Alexander would scoff at this ‘prediction’ as he forecast back in 2008 drought for specific areas of South Africa. I’m sorry I can’t load a link so cut and paste this in your browser. As the globe has warmed over the last century, the Indian Ocean has warmed especially fast. ..this isn’t science, this is nothing more that “if this trend continues”. I can save alarmist researchers some time so that they can get grant money faster. Just use this template to start your study and pad the rest from there. Just use one of these two templates. The increased frequency of [insert undesirable condition here] over the last [insert relatively short time period here] [may/is likely to] [increase/accelerate/reach a tipping point] because of man-made climate change according to new [research/computer models] from [insert person or group that supports AGW here]. The [insert scary adjective here] reduction of [insert plant species, animal species, or something related to ice] over the last [insert relatively short time period here] [may/is likely to] [disappear by a date far enough away so people would forget this but not far enough away to make people worry/because critically endangered/become extinct] because of man-made climate change according to new [research/computer models] from [insert person or group that supports AGW here]. There, now these scientists can get new grant money faster. Just look at how many studies already follow this template, such as this one. I’m sure I read somewhere that it was the Antarctic Peninsula. La Niña results in wetter than normal conditions in Southern Africa from December to February, and drier than normal conditions over equatorial East Africa over the same period. Southern Africa is known to be one of the regions world-wide to be most strongly impacted by an El Nino period, together with parts of South America and South-East Asia. In Southern Africa, it is followed by severe droughts almost every time it occurs. Severe malaria outbreaks in East Africa follow above-normal rainfall from a warmed Indian Ocean during El Niño events. Sub-Saharan Africa: Map of Mineral Resources and Political Instability. The total capacity of large and medium dams (> 15 m) is about 4.1 km3. In order to augment water supply, 1 782 small dams and 669 water pans have been constructed. There are 9 lakes with a surface area of 10 747 km2. Most of the lakes are saline with the exception of Victoria, Naivasha and Baringo. The lakes Nakuru and Naivasha have been declared Ramsar sites as wetlands of international importance for conservation of biodiversity. There is limited seawater desalinization mainly for the hotels along the coast. Africa has enough problems, they don’t need our help, if all we have to offer is our scary climate change scenerios. Political pressure is already applied by machete. OT – sorry but just found. I wonder why? Is it because of the paper by Gavin etal that said warmer winters are a result of the greenhouse effect and a new paper which said the opposite? Maybe Kenya was secretly admitted to the Union. That would explain how both sides of the “birther” debate could be correct, and WTF the USGS is doing on the wrong continent. So it is warming quickly (but not the most quickly), and it is currently near the warmest areas on earth (but those areas were already warm ,so they weren’t necessary warming much). Hmmm — this raises and interesting question. The surface temperature of the Indian Ocean is critical to the formation of the Indian monsoon season. If the Indian ocean is too cool the monsoon starts late or does not occur, so who is going to determine what the ideal temperature of the Indian ocean is? In folks in India that depend on monsoon moisture to farm or the Africans that have dry weather when the Indian ocean is warmer. Seems we have competing interests here. If they cool the Indian ocean too much then they will simply move famine from Africa to India. Not sure I would want to get in the middle of that argument with a Nuclear India concerned about defending their Monsoon rains which literally bring life to much of their nation. Goes back to the question who is going to decide what the ideal climate is for each region. I REFUSE to listen to their dire warnings of doom and gloom. Too much of a good thing me thinks. This drought, a very serious one indeed, but not unprecedented; it has been aggravated by over grazing and deforestation, particularly in watersheds. It will not get better. The population explosion in a dry region will be accelerated by the recent introductions of goats in place of the ancient cattle. In a continent the size of Africa you will always have FLOODS and DROUGHTS. This seems like cherry picking. When they cherry pick I will cherry pick. Twenty years is just the weather and not climate. Scientists compiled existing datasets on temperature, wind speed and precipitation to see what was driving climate variations in the tropical Indian and Pacific Ocean region. Most of the Indian Ocean warming is linked to human activities, particularly greenhouse gas and aerosol emissions. By compiling data on temperature, wind speed and precipitation, they’re able to conclude that “most of the Indian Ocean warming is linked to human activities, particularly greenhouse gas and aerosol emissions”? Just based on that, how can they say that “climate variations” like La Niña and El Niño are “linked” to aerosol emissions? Ah, well. At least they’re counting H2O as a greenhouse gas. Increased humidity, right? “Forecasting precipitation variability from year to year is very difficult, and research on the links between global change and precipitation in specific regions is ongoing so that more accurate projections of future precipitation can be developed,” said University of California, Santa Barbara, scientist Park Williams. I would be happy to see even a skerrick of evidence of successful forecasting of precipitation variability from year to year, ever, anywhere in the world. Sadly, no such skerrick exists, or is likely to in the (ahem) forseeable future. Next, they will be asking for money to predict the number of snowflakes that will land on the roof next year. Hubris, hubris, hubris. Not that I would care if only these ‘researchers’ were using their own money. Wade, love your grant application template. Slightly modified, it is also a template for AGW alarmist articles in the MSM. The climate ‘science’ gravy train is loaded with intellectual pygmies. This was written by Sheldon Harnick in 1958. !! Well Before AGW !!! Sounds like nothing much has changed… including the weather… er… climate. I didn’t read the article. Do they define “Global Warming”? Do they say what causes it? Do they have evidence of it being man-made? I think not. Good Lord, do you realize what that means? I didn’t know they had such a drug problem. So what weather events are not consistant with AGW? These people need to do their homework. The reason for the current dry spell, “after several consecutive seasons with above average rainfall in East Africa, an unusual event in this drought prone area”, is the combination of La Nina conditions in the Pacific with a negative Indian Ocean dipole. These circumstances are what have also led to Australia’s recent flooding rains over large swathes of the country. If USGS want to change things, they should STFU about CO2 and find a way to control ENSO and the IOD, to get them both permanently in the ‘ideal’ mode for the whole world. Good luck with that, chaps. Better apply for a grant now. who’s paying for all this? i can guess but i don’t think i want to know…. It is not hard to find their mission. Since the environment, the resources we rely on and the climate definitely affect the US but have global reach, it would seem reasonable for the USGS to be interested in the rest of the world — kind of like the US Marine Corps and US Department of State are have a global outlook. Observations and simulations link anthropogenic greenhouse and aerosol emissions with rapidly increasing Indian Ocean sea surface temperatures (SSTs). Over the past 60 years, the Indian Ocean warmed two to three times faster than the central tropical Pacific, extending the tropical warm pool to the west by ~40° longitude (>4,000 km). This propensity toward rapid warming in the Indian Ocean has been the dominant mode of interannual variability among SSTs throughout the tropical Indian and Pacific Oceans (55°E–140°W) since at least 1948, explaining more variance than anomalies associated with the El Niño-Southern Oscillation (ENSO). In the atmosphere, the primary mode of variability has been a corresponding trend toward greatly increased convection and precipitation over the tropical Indian Ocean. The temperature and rainfall increases in this region have produced a westward extension of the western, ascending branch of the atmospheric Walker circulation. Diabatic heating due to increased mid-tropospheric water vapor condensation elicits a westward atmospheric response that sends an easterly flow of dry air aloft toward eastern Africa. In recent decades (1980–2009), this response has suppressed convection over tropical eastern Africa, decreasing precipitation during the ‘long-rains’ season of March–June. This trend toward drought contrasts with projections of increased rainfall in eastern Africa and more ‘El Niño-like’ conditions globally by the Intergovernmental Panel on Climate Change. Increased Indian Ocean SSTs appear likely to continue to strongly modulate the Warm Pool circulation, reducing precipitation in eastern Africa, regardless of whether the projected trend in ENSO is realized. These results have important food security implications, informing agricultural development, environmental conservation, and water resource planning. Is there anything here you specifically disagree with? Are you suggesting that this is wrong because it doesn’t ALSO mention “land use change, agricultural practices, or deforestation issues”? increased precipitation in tropical eastern Africa as a ‘likely’ response to anthropogenic global warming.” It looks like IPCC AR4 is coming up short once again! Read again, it said the tropical warm pool was warmest OCEAN surface temp, and the worlds not cooling, all the data supports that, even if your belief doesn’t. The facts are that the globe over the long term is warming due to human caused increased co2. That has never changed. The other side of the equation is that this causes climate change. That part is unpredictable and translates into weather, likely more extreme as patterns shift over the short term, to increasingly inhospitable over the long term. How that translates regionally has never been claimed to be fact but has always been under likely or less likely scenarios. No conflict, quite simple really, is that so hard to understand? I must agree with Tim Folkerts. I think some of you are giving the USGS a bad rap. (I may be just a little biased of course.) Thanks for the song reminder. I remember singing that with my friends when in high school. And I still, “don’t like anybody very much”. The fact that “most of them have moved to minneapolis Minnesota” is a BIG worry! I don’t have a problem with “appropriate” international USGS operations. For example, they can learn a lot about volcano or earthquakes and possible prediction technologies by going to where current volcanic eruptions and active earth quake areas are. They also have an obligation to comment on and provide appropriate technical evaluation of international projects that the U.S. has either a financial interest in or a strategic interest in (ie Panama canal construction). In some cases definitive geological structures only occur in a few locations world wide, and you have to go where the evidence is since you can’t bring the evidence to the lab. It is reasonable in my view for them to investigate a major drought area, as what they learn there can be applied to drought situations in the U.S. (remember the dust bowl). It is one thing to trot off to some tropical paradise for a seminar (global warming conferences) and another thing entirely to go where the geological evidence takes you to investigate issues like water tables, and ground water depletion, erosion, drought, volcanic eruptions, tsunami investigations etc. The field sciences by their very nature demand a world wide perspective, whether you are an oceanographer, geologist, hydrologist, archeologist etc. It also is perfectly reasonable for the USGS to investigate the geology of Afghanistan during a window of access for two reasons. It may be another 50 years before we have relatively free access to this geological setting. No telling what they might discover about geological processes there. Second if we can help Afghanistan build a viable mining industry that gives them some other means to make a living besides herding goats or growing opium, I think that would do a lot for the stability of the region. If that helps them to have a productive industry that can help them profit from their geographical situation, and stand on their own economic feet, rather than be the perpetual ward of neighboring industrialized nations, I consider that a good thing. Oh my… if this prediction works as well as “droughts in Australia” I suspect the countries in question will be under two feet of water next year .. just sayin. Funny this is the short of prediction we got continually from the CSIRO and Bureau of Met and Tim Flannery and a few other “experts” here in Oz. Until the floods of course and now they have done a 180 degree backflip to say GW can mean both Dry and Wet. No wonder people are getting fed up with this BS. The facts are that the globe over the long term is warming due to human caused increased co2. That has never changed. Neat sleight of hand there. However, over the long term, warming is due to natural variation. That’s the null hypothesis, despite what Trenberth and apparently you want to happen. Any warming due to “human caused increased co2” has yet to be proven—until that changes, your belief counts as nothing. Katherine maybe I framed that statement incorrectly. I meant by long term as in longer than weather events and more in line with the period that is considered climate, generally about 30 years. This is proven. The previous 3 decades have been the hottest since reliable records, and increasing each decade, it has also been increasing at the same time as CO2, a known greenhouse gas. All other possible explanations that are currently knowable, such as solar activity, volcanoes and planetary cycles cannot explain the warming as a natural occurrence. In fact, since the sun has been in a low sunspot activity we should be cooling, which makes warming even worse. 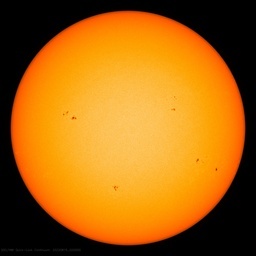 What will happen when the sunspot activity increases? We are currently outside the norm for natural variation taking all known factors into account. The only explanation left is the increasing imbalance of CO2 due to man. This constitutes proof to a 95% probability according to scientists who specialise in this area and all scientific organisations. I thought I’d heard this before! Heres a couple of link to papers on CO2 science. Both showing that the indo-pacific warm pool was hotter than today. I taking a guess here that the Indian ocean would have been hotter than today. These guys should be struck off. Not sure if yo can do that to scientists. They are making claims without the slightest bit of evidence. Science, this is seriously junk science, voodoo science. I don’t have a problem with Geologists doing geology anywhere. I can speak only for Ethiopia and Chris Funk is so wrong it borders on total ignorance of this region. Temperatures in Ethiopia are NORMAL, so too is rainfall. There is no food shortage in Ethiopia, and hasn’t been since the 1983 famine (Yes, it was drought that affected most people which were mostly in a drought prone region), contary to the statements of Chris Funk. Ethipopia is a good example of how farming practices have changed since 1983. What is in short supply is enough money to pay for the food available by the poor. If we use Teff as an example, the primary staple, has, in the last 4 years risen from ~AU$95 to AU$200 per 100Kg bag. Added to this the costs of energy/fuel rising at rates beyond inflation compounded by fuel subsidies being reduced or removed completely. As the west heads down the “carbon free” economic path, its always the poor in developing countries who are least able to absorb higher living costs. There is an old saying- Give a man a fish and he has one good meal. Teach him to fish and he eats well for life. This is the way to go. Give people a good education and the ability to grow their own food not rely on others. The real reason that the Horn of Africa has 17.5M starving is, as stated above, civil war. The real reason why food from America and Europe fails to get to the starving is lack of efficient transportation, lack of reasonable roads and corruption of the local governments. Oh and the civil wars. Or as we learned in Ringworld . . ” Light a fire for a man and you keep him warm for a day, set a man on fire and he is warm for the rest of his life” . Whilst my own, very detailed , rainfall records show different my government insists that the past ten years of poor agricultural output have been because of persistent droughts and floods often in the same year. Prior to 2000 we were able to feed ourselves and export surpluses, not to mention furnish raw materials for a wide range of manufacturing concerns. Since then we have been dependent on the generosity of the USA for varying proportions of our food and the industries have long since closed. Rainfall here in Zimbabwe hasn’t changed much in the last 100 years , nor has the cropping cycle. What has changed here is the type of agricultural activity. We used to do things in a modern fashion whereas nowadays we do it in a medieval style of largely subsistence farming. This hasn’t stopped my government from demanding compensation for “climate change” from the developed world, mainly those very nations who are helping feed our , recently, poor nation. Our ministers seldom miss an opportunity to bang on about the nasty western imperialists who have changed our weather often linking it to a “regime change” agenda on the part of the west. It is never anything to do with poor government at home, as is the case I presume in Kenya. Please define ‘imbalance of CO2’, first generally, and then in terms of the history of this planet. Second, please demonstrate, with hoops of steel, how your 2 propositions are bound together. seems no one else has heard? theres some severe flooding in Africa right now..
book waterwars explains the african water issues, wars dams and despots. Looking for a drought?….just wait for the next july´s “dust bowl”…. For Mike Jewitt: your link worked . . . great . . . very interesting . . . Please define ‘imbalance of CO2′, first generally, and then in terms of the history of this planet. There is currently more CO2 going into the atmosphere than leaving the atmosphere, which is pretty much the definition of “out of equilibrium”. The much of the extra CO2 is easily attributed to human activities, which have been increasing over the last century or two. There is certainly room to debate how much of the warming in the last 30 years or 100 years or 300 years is man-made. But given the basic physics of GHGs, it seems highly unlikely that NONE of the warming is man-made. I hope you see this Kenith. I completely agree with your assessment. Based on my reading, about seventy per cent of Africa’s population rely on rain-fed agriculture for their livelihoods. IPCC concluded in 2001 that many rain-fed crops in Africa are near their maximum temperature tolerance, so yields are likely to fall sharply for even small climate changes; falls in agricultural productivity of up to 30% over the 21st century are projected. Q: genetic heat and drought resistant hybrids for common Africa crops like Maize should be / have been developed? Its reasonable to conclude, regardless of slightly rising temperature, ENSO events will continue to cycle; see my prior post. Desalination plants for Kenya lakes and tapping the aquifers in the Congo are logical. Drought-tolerant strains of common crops is a must in my opinion. I’d really like to see some intelligent support for Africa instead of crisis aid but the probability it will come from the USGS is zero. If you’re like me, you’re scratching your head and wondering why money is being wasted on the Climate meme and not put to the purpose of fixing real problems. So the IPCC concludes in 2001 and it takes 10 years before someone addresses the real problem (heat and drought resistant hybrids for common Africa crops). The UN is pitiful. Disappointingly, there’s no mention of land use change, agricultural practices, or deforestation issues like the one contributing to the glacier melt on Kilimanjaro. Evapotranspiration is a very important issue for local moisture content and convective cloud development. The research concludes that the source of African moisture will be reduced. So it appears these additional factors will make things even worse. The paleoclimate record indicates that exactly the opposite of drying out will happen. 6000 years ago even the Sahara was a well watered area and temps were well above today’s levels. Thats not in question is it. CO2 had been fairly steady for 10,000 years and then in the late 1800 (when we started to seriously burn fossil fuels) it started to shoot up. It went from about 280ppm to 389.69 for december 2010. So from a stable state, where the planet could naturally absorb all the naturally occurring co2 to a period where the level is steadily rising in our atmosphere, coinciding with our burning of co2, demonstrating quite convincingly I would think that the earth cannot absorb the co2 being produced. Hence imbalance. I don’t know where the ‘hoops of steel’ come into it, but I thought I had already linked it to temperature, with the greenhouse effect. Similar prophesies were made about Australia needing to get used to continual drought and lower rainfalls. These led, in part, to the lack of preparedness and response to the recent floods. Like an earlier poster, Bob Highland, I think they need to avail themselves of the knowledge that has already been accumulated on the Indian Ocean Dipole. Then to hopefully grasp a glimpse of the big picture, they need to study the rainfall patterns in all the areas that border the Indian Ocean, as what may be happening on one side of the ocean is reflected in what is happening on the other side. The IOD is such that when it brings drought to those locations on the western side, it is bringing rain to the eastern regions, and vice versa. More proof that “climate science” is an oxymoron.